Belmont College will provide affordable, achievable, and meaningful academic degrees and technical training to all who seek them. 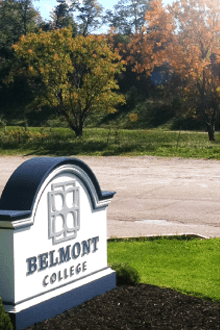 Belmont College will be a first choice among our potential students seeking quality academic degrees and technical training that is also affordable and achievable. Belmont College is a learning organization that embraces a culture of continuous knowledge acquisition, integrity, openness, caring, and respect for all. Access, affordability, and quality are operational values that inspire the college community to be its best. The College continuously transforms itself to respond to changing community, regional, and state needs.